Boris Drayluk’s Western Crime Fiction Goes East is an impressive and enormously enjoyable piece of literary and cultural analysis, providing the first substantial study of “Pinkertonovshchina” – the early twentieth-century Russian appropriations of stories featuring American and British detectives such as Nat Pinkerton, Nick Carter, Sherlock Holmes and many others. By focusing on this phenomenon in both pre- and post-Revolutionary Russia, Drayluk is able to explore the role of a hugely popular genre in a time of major social transition. Popular reading, as he argues, is not only an indicator of tastes and aspirations but an influence on them and a carrier of social meanings that can be viewed as supporting or undermining political movements and institutions. By means of his careful, scholarly and politically informed examination of the Russian appropriation of Western detective fiction, Drayluk is able to shed valuable light on genre formation, hybridization and popular reception, as well as on the vigorous critical debate surrounding the socio-political meanings of popular literature. The book opens with an examination of the emergence in Russia of Westernized detective serials in 1907 and moves through to the post-Revolutionary advent of the “red Pinkerton”, which Drayluk regards as a crucial link in our understanding of the evolution of Russian-Soviet popular culture: “Although the path from Pinkertonovshchina to Socialist Realism and mainstream Soviet entertainment is full of evolutionary dead-ends, the “red Pinkerton” emerges as a vital “missing link” between pre- and post-Revolutionary popular literature, and the fitful start of a decades-long negotiation between the regime, the author, and the reading masses.” Western Crime Fiction Goes East provides fascinating insights into the evolution of Russian-Soviet popular culture and is a significant and striking addition to the current critical focus on cross-cultural crime fiction. Boris Drayluk is Editor of The Black Mask Magazine website (where much of his, and other outlaw scholar’s most recent work can be found), and also Managing Editor of the new book line of fiction from Black Mask Magazine, THE BLACK MASK LIBRARY. Forthcoming publications include important new collections of the work of Theodore A Tinsley and Paul Cain: Theodore A. Tinsley, Jerry Tracy, Celebrity Reporter (Black Mask), Introduction by Boris Dralyuk, MysteriousPress.com/Open Road, 29 October 2013 – available on Amazon; and Paul Cain: The Complete Stories (Black Mask), Introduction by Boris Dralyuk, MysteriousPress.com/Open Road, 17 December 2013 – available on Amazon. This book examines the staggering popularity of early-twentieth-century Russian detective serials. Traditionally maligned as Pinkertonovshchina, these appropriations of American and British detective stories featuring Nat Pinkerton, Nick Carter, Sherlock Holmes, Ethel King, and scores of other sleuths swept the Russian reading market in successive waves between 1907 and 1917, and famously experienced a “red” resurgence in the 1920s under the aegis of the Soviet Union’s chief theoretician, Nikolai Bukharin. The first chapter analyzes these stories’ reception among their young readers, relying on surveys from the period, as well as on memoirs and letters by Soviet authors like Valentin Kataev, Leonid Borisov, and Sergei Esenin, who read the Pinkertons as children and young adults. It also examines the serials’ reception among critics, pedagogues, and Kulturträgers like Kornei Chukovskii. The contrast between these two “readings” of Pinkertonovshchina would persist throughout the phenomenon’s life span, which came to an offficial close in 1934. The following two chapters present an analysis of the Pinkerton as genre, relying on recent work in cultural and popular culture studies, as well as a social history of their production. The serials were published anonymously, but rumors and theories about their authorship shed further light on their reception and on late Imperial Russia’s popular culture (“Westernism,” modernism, French Wrestling, the circus, aviation, and film). The fourth chapter focuses on the surprising consistency of Pinkerton reception between 1907 and 1934. The remaining three chapters examine the rise and fall of the “red Pinkerton,” one of the Soviet regime’s first attempts to sponsor a thoroughly Soviet literature based, paradoxically, on what it regarded as an irredeemably bourgeois genre. Newly discovered information about Bukharin’s “call” for “red Pinkertons” illuminates the cultural and political context in which the genre arose, including the role played by the New Economic Policy (NEP), the Proletkult, and the Komsomol. These final chapters offer a thematic and formal survey of such prominent “red Pinkertons” as Marietta Shaginian’s Mess-Mend (1923–24), Vsevolod Ivanov and Viktor Shklovskii’s Mustard Gas [Iprit] (1925), as well as Kataev’s Erendorf Island [Ostrov Erendorf ] (1924) and The Sovereign of Iron [Povelitel’ zheleza] (1925). These chapters also situate the “red Pinkerton” in the context of Formalist-Serapion theory and praxis—including abstract notions of parody, generic hybridity, and the kinoroman—examining such works as Fedor Otsep and Boris Barnet’s film Miss Mend (1926), Elizaveta Polonskaia’s poem “In the Noose: A Lyrical Film” [“V petle: Liricheskaia fil’ma”] (1923–25), and Aleksandr Arkhangel’skii’s satire “Kompinkerton” (in Communist Pinkerton [Kommunisticheskii Pinkerton]) (1926). This book presents the first holistic view of Pinkertonovshchina as a phenomenon spanning the late Imperial and early Soviet periods, and holds out clues to the psychological motivations of those who devour popular genres in times of social flux. It also produces a working model of cross-cultural appropriation and reception with application far beyond early twentieth-century Russia. The Soviet regime’s limited compromise with “tawdry,” if not downright “dangerous,” pulp fiction emerges as more than an anomaly—a failed experiment lending way to characteristic suppression. The “red Pinkerton” is a vital “missing link” between pre- and post-Revolutionary popular literature, and marks the fitful start of a decades-long negotiation between the regime, the author, and the reading masses. It also serves as a gauge of the strength and impact of public demand in the “controlled” market of Soviet and contemporary Russian cultural production. 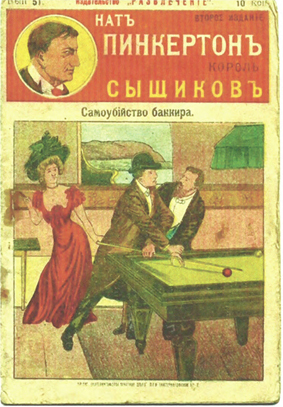 Illustration: Cover of the second edition of the fifty-first installment of the Russian Nat Pinkerton, King of Detectives, titled A Banker’s Suicide [Samoubiistvo bankira] (originally published in 1908).